The range and quality of makeup available has never been better – from primers and foundations, to liquid lipsticks and eyeshadows – we all have access to the products and tools needed to create fantastic makeup looks. Don’t make the mistake of thinking primer isn’t necessary, a decent primer will ensure smooth eyeshadow application, will help make eyeshadow pigment pop, and will prevent it from fading or creasing. There are a wide range of primers available on the market – Avon’s mark. magix primer is just £10.50 and their serum infused primer from the Anew range is just £15. Are you a victim of the sponge applicator? Nearly all eyeshadow palettes come with one, but that doesn’t mean you should use it. A sponge applicator can come in handy for applying colour to the lid or for using the very edge of it to smoke out under your eye. However, for professional looking application and the all-important blending, you need to invest in some decent brushes. Good doesn’t have to equal pricey. Good eyeshadows have a buttery texture, are highly pigmented, and blend easily. The best eyeshadows have minimal fall out (the annoying powder that drops on to your cheekbones when you’re applying it). Beginners should stick with solid eyeshadows, and leave loose pigments, mineral-based eyeshadows, and eyeshadows with lots of glitter content to those who are more comfortable with applying them, as they all notoriously have more fall out. 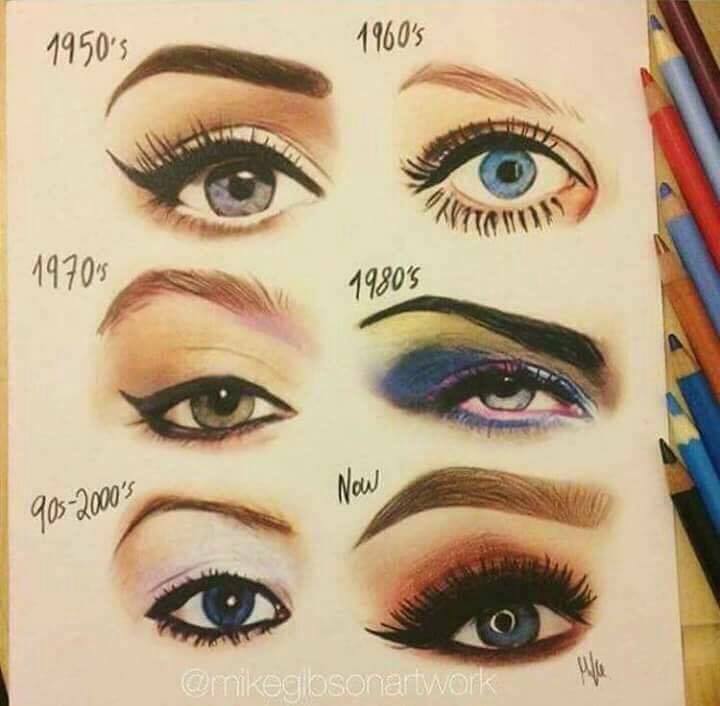 In years gone by, people used to match their eyeshadow colour to their outfit, or opt for whatever colours were on-trend. Anyone else remember the powder blue eyeshadow of the 80s? Now, we know better. The best thing to do is wear eyeshadow colours that complement your eye colour – it really adds the “wow” factor. If you have blue eyes stick with copper, peach, and orange-based eyeshadows and undertones, brown eyes should work with cobalt blue, navy, and purple-based eyeshadows and undertones, and green eyes look amazing with purple, red, and berry-toned hues. Some of us just love our glitters and shimmers, but don’t be tempted to use them all over the eye. Light and shimmery colours emphasise and draw attention, and are best used on the eye lid, while matte tones add definition and should be used in the crease. A subtle shimmer is great for a highlight on the brow bone. 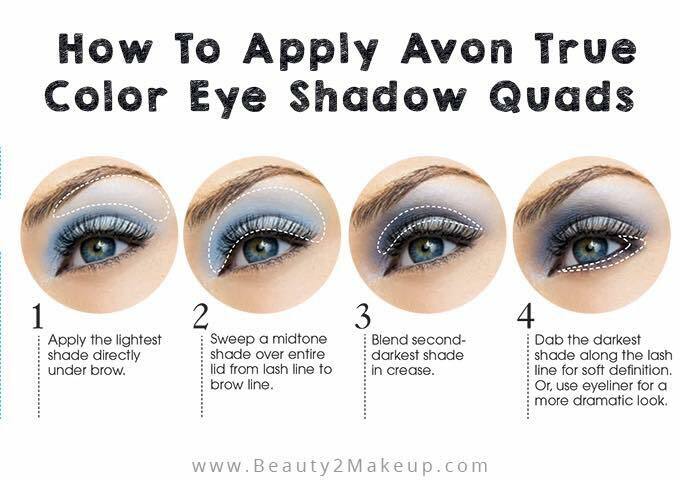 The simplest way to create a great look is to use four eyeshadow colours, Avon eyeshadow quads are perfect for this look as they have four complementary colours. The lightest colour should be used under your eyebrow on your brow bone as a highlight, such as a shimmer cream or white, the second lightest colour should be applied on your lid, such as a shimmer copper, a darker matte shadow should be used in the outer corner, such as a matte red-toned brown, and a final eyeshadow – the darkest – should be used to define the outer corner, and can also be used gently under the eye along the lower lash line to help create a smoky eye and bring the whole look together. Cream eyeshadows are good for the lid and can be used in place of a primer or eyeshadow base. Cream eyeshadows in the same colour as the eyeshadow you will use on your lid will help it pop. Pressed eyeshadows such as those in a palette are the most versatile – remember after you have used a brush to pick up some eyeshadow to tap off the excess to help prevent fall out. Loose eyeshadow powders tend to be the most pigmented, but are the hardest to work with. Dampening your brush ever so slightly before using loose powder eyeshadow definitely helps make it easier to apply, and helps prevent fall out. Often, we don’t get the chance to practice with eyeshadow looks as we do our makeup before we leave the house, and don’t want to experiment then in case it goes wrong. Even if you’re sitting in, create an eyeshadow look so you get the chance to practice application and blending techniques. It might seem like a bit much effort to make just for a night in front of the TV, but you’ll thank us the next time you’re heading out on the town and your eyeshadow is on point. Brows 101 – How To Properly Shape Your Perfect Eyebrows To Suit Your Face Shape.